One of the best ways to allow your dog to use an electronic dog door and go outside to their dog house or outdoor dog kennel is with an electric dog fence. But how do you know which electric dog fence to choose and how do you install one? These are questions that everyone with a pet asks at one point or another, and the solution is contained within this buying guide that will give you some great information on how to choose the right electric dog fence as well as how to install it. We will also be looking at the top five electric dog fences that are currently on the market. Hopefully, this information will be able to help you get the right fence for your pet and make your life a little easier with this technology. Let’s look at the top five electric dog fences on the market. No matter what breed your dog is including Labrador Retrievers, German Shepherds, French Bulldogs and Poodles, you will be able to choose an electric fence that fits your dog perfectly and keeps them contained while still allowing them the freedom to go out and play or do their business. This PetSafe electric fence is a really simple wireless electric fence that covers up to three quarters of an acre with an adjustable range allowing up to 105 feet in every direction. The transmitter can even be housed indoors, which makes this one of the top choices out there when it comes to wireless fences. Often, electric fences can take a great deal of time to install, including placing the wires and burying them underground or installing them above ground. But this is a simple electric fence that you place in the center of your home and it prevents your dog from going more than the preset distance from your home to the boundary. This comes from one of the top brands in the industry for electric fences, and it is a fully featured product that contains everything that you need to install an electric fence and make it work for you. One of the best things about this particular electric fence that pet owners will love is that they are able to use it on lots of different pads and an unlimited number of pets. This is not a pet fence that works for just a single dog or cat; it is one that will work for your entire cadre of pets. Since it is adjustable and fits on the collar, you can install this on just about any breed including Beagles, Rottweilers, Yorkshire Terriers or Pointers. There are also multiple levels of correction available with this wireless fence. That means that if you have a dog that is resistant to the first couple of levels, you still have three to go after that to get them to stop going out of the boundary of your yard. This also fits multiple dogs, and it is an ergonomic collar with the charge that lasts up to three weeks depending on how frequently your dog wanders out of the yard. This is an extremely long time for battery life. This Extreme dog fence is not the most versatile fence on the market, but it is one of the best, and it has a major advantage over all of the others listed here that you will really like. This fence does not follow the one-size-fits-all model, so you only get as much fence as you need. That means that you do not have to pay for a one-size-fits-all approach or for more fence than you are going to need. The smallest fence starts at 500 feet and then goes all the way up to 2500 feet. There are 10 fence sizes within that, half of them being the pro and half of them being the standard. In addition, you choose between how many dogs you need this system for. You can choose anywhere between one and five dogs, which means that you are also not paying for any extra dogs if you do not need them. If you just need one dog system for a very small yard, you’re going to pay a lot less for that then you would for a five dog system with the 2500 foot yard; this is a major advantage over most of the fences on the market these days, and even some of the fences listed here in the product reviews. In addition, this fence covers up to 25 acres with updated electronics that are compatible with the new colars. There are three antennas and a 12 X battery check. These are also waterproof and nearly invisible. You can even submerge the receiver in water up to 10 feet deep and this electric fence will still work perfectly. It comes with 20 gauge high tensile boundary wire with amazing performance and from a company that has been manufacturing high-quality pet products for a long time. This is one of the best electric dog fences on the market and gives you a huge number of options when it comes to customizing your fence to your specific needs. 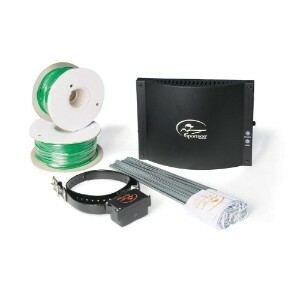 From SportDOG comes this in-ground fence system which comes with tons of wire and other installation materials. This is an all-in-one system that will allow you to make a fence extremely large that is going to fit any front or backyard. You can actually expand this fence all the way up to 100 acres, making it the best choice when it comes to rural areas or extremely large yards. This is also one of the easiest to install fences currently on the market with more than 1000 feet of 20-gauge wire and 100 flags that will allow you to contain almost two acres with just the basic installation, and then more than 100 acres with the expansion materials that you buy separately. In addition, this comes with a completely waterproof collar receiver that works with multiple alert systems. The collar will vibrate as your dog crosses the fence line as well as emit a loud tone that dogs are able to hear easily. In addition, there are four other correction levels that you can select based upon how effective the correction is for your particular dog. Some of the other advantages that this system offers include a built-in lightening protector and surge protector, an alarm to let you know if the underground wire is damaged or becomes disconnected and the aforementioned expansion. You can also use this for all of your dogs with an unlimited number of additions as long as you purchase the additional collars. They are available in many different sizes so they will fit the very smallest dogs, small dogs, medium-sized dogs, large dogs and even extra-large dogs. The system will quit using power if your dog is standing in the warning zone for too long to avoid using up the battery and the charge will last for up to a year without having to change the battery. Plus, this system has some terrific customer service built right into it, so you can be sure of getting it set up exactly right. 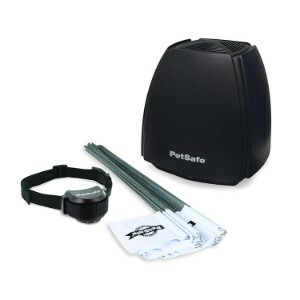 This is another PetSafe fence, and one of the wireless fence models that lead the industry – which is why it was included on this list. PetSafe is a great brand, and allowing your dog the freedom to traverse a designated area instead of fencing them in can be really healthy. This is a very easy fence to set up, suitable for both dogs and cats, and just like a dog bed, dog playpen or dog crate, this is an accessory that is going to improve the quality of life for your dog. In fact, it is one of the best Christmas presents for dogs, right up there with things that will bring joy to their life like puzzle toys for dogs, cooling vests for dogs or cooling pads for dogs and automatic fetch machines. This electric fence system is terrific because it does not require any digging and it is super easy to install. You don’t have to bury any wires, and your yard can be any shape with adjustable boundaries that will cover up to a ½ acre that is 180 feet in diameter. The collar is also one of the most advanced collars out there with sizes that fit any dog that is more than 5 pounds and with neck sizes ranging all the way from six inches to 28 inches. In addition, there are five levels of static correction as well as a tone-only mode so if your dog does not need the shock feature you can simply correct him or her at the fence line with a sound. You will have this fence set up in about two hours, so it is perfect for taking with you anywhere you go as well as placing in your yard. Often, people get this fence because it is so portable. The range will depend upon several factors, but it is pretty consistent despite land features, metal objects and more. In addition, it comes with a manufacturer’s warranty and the batteries will last for about two months before they ever have to be replaced. 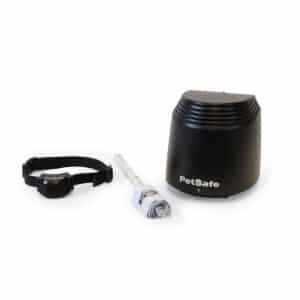 PetSafe has yet another entry on the list. This in-ground fence for dogs and cats is a really comprehensive system with plenty of customer service behind it. It works with 14-guage all the way up to 20-guage copper insulated wire so you are able to expand the fencing system yourself if you need to, and the materials that it comes with will allow you to fence off up to a third of an acre. You can expand up to five acres total with the central base unit that is included, but you will have to get additional wires and flags to go with that unit. In addition, this electric fence offers a lightweight and easy to use dog collar that is designed for dogs over 8 pounds. The neck sizes that are available range from 6 inches to 26 inches and these collars will allow for the use of things like a dog seat belt or the openings in a dog car seat cover, a GPS tracker for dogs or dog activity monitors. These collars are not only adjustable and made to fit on almost any dog they are also waterproof with four different levels of correction as well as a tone mode. There is even a low battery indicator that lets you know when the battery needs to be changed before it actually runs out. In addition, the collar battery will last up to 60 days and the entire system is covered by a manufacturer’s warranty as well as a toll-free number for customer service that is available six days a week. This is a terrific electric fence system and you and your dog will be very happy with it. There is a lot to understand about buying the best dog fence than just reading invisible fence reviews. But the first thing that you have to understand before you can make any buying decisions is how an electric fence actually works. The reason for that is simple: there are multiple ways in which an electric fence can work and determining which one is your preference is part of that buying decision. Then there are other factors that you have to consider as well such as the components and features that go with an electric dog fence or other pet containment system. For example, you have to decide whether the fencing system is going to be big enough for your property and work with all of your dogs if you have more than one. You also have to look at how the system actually notifies your dog that he or she has crossed the boundary and how you are able to set up these boundaries. Plus, battery life, correction levels and various other factors have to be looked at. The purpose of this buying guide is to bring up all of those factors and go through them one at a time so that you have an idea how much importance to assign to each of them and so that you can see what your options are before you make a buying decision. Each dog owner is unique, as is each dog, and the type of wireless dog fence or containment system that you set up should be perfectly suited to that uniqueness. There are numerous benefits of electric dog fences is that you should be aware of. Installing an electric fence is always a good choice, even opposed to installing an actual fence. Let’s take a look at some of the major benefits that come from having this type of canine containment system. For one thing, an electric fences going to be a lot cheaper than installing a regular fence and it is going to take a lot less work. Even if you install a conventional fence yourself, you are going to have to go and get the materials from a lumber yard, dig the post holes, install the fence slats or barriers, do any painting or treatment that has to be done and then maintain the fence over time. This is a process that can take weeks to finish and cost thousand dollars or more. But an electric fence cost only a fraction of that and most can be set up within an hour or two. Even if you have your electric fence set up by a professional, the final cost is going to be much, much lower than a conventional fence made of wood or chain-link. You also have to be concerned with various city ordinances and fencing regulations when you build an actual, physical fence. There may be restrictions on how high you can build the fence or whether you can put one up at all. You will have to check the regulations in your area to find out for sure if that is going to be an issue, but it is one of the reasons that so many dog owners choose to go with an invisible fence rather than build one themselves. In addition, an electric dog fence is a lot more discrete then building a fence of wood or surrounding your property with chain-link. You may have landscaping features that you want seen, and building a fence is going to prevent that. Of course, sometimes the opposite is true. Sometimes, people build a fence because they want privacy around their yard. However, with a fence around your house you are going to alienate yourself from your neighbors and the only person that will enjoy your flowerbeds and freshly-cut lawn is you. In addition, an electric fence is going to make your pets happier. You know that your pet requires plenty of exercise, but what you might not know is that putting them out in the backyard with the fence surrounding them demonstrates a certain amount of restriction. But with an invisible fence, pets feel as if they have a lot more open space to explore, even if they cannot actually go across the borders of the pet fence. Then of course, there are the actual benefits of fences for pets in general. Fences keep your dog from running off and getting lost, they prevent your pets from getting hit by cars by wandering out into the road and they ensure that you always know where your pet is; even allowing you to install pet doors to allow them free access to the yard whenever they want to go out. Understanding how these types of fences work is also important before buying one. There are three basic types of electric dog fences. There is the wired above ground fence, the wired below ground fence and the wireless fence. We will discuss the wireless fence in the next section. Here, we will concentrate on the two types of wired fences. There are advantages and disadvantages to both of these types of wired fences. Let’s start with the above ground fence. As the name suggests, the wire is installed above ground, usually by just a few inches. The advantage of this type of fence is that it is a lot easier to install. The below ground fence takes a lot more work. With this type of fence, all you have to do is string the wire along the ground on the borders of your fence and connect it. After that, you are essentially done. You don’t need to remove anything, dig or do any work other than laying out the wire. However, this method also has some disadvantages. For example, the weather or other factors can move your wires so that the fence changes position. In addition, it may be a hazard for humans who wish to cross over the fence because they could trip over the wire. Plus, even though above ground fences are almost invisible, they are not actually invisible, so people may be able to see it when they get up close. This may make your yard a lot less attractive than you prefer. Of course, there is also the other option – the underground electric dog fence. With an underground fence, there are no wires to trip over or two turn your backyard into an eyesore. You won’t have to worry about running over the wires when mowing your lawn because they simply will not be accessible. But the disadvantage of the underground option is that you are going to have to do a lot more work to install the fence. You’re going to have to dig trenches to put your wiring all the way around your yard – something that can take a significant amount of work if you have a large yard – and this could result in accidents like digging up a sewage line or affecting your grass. 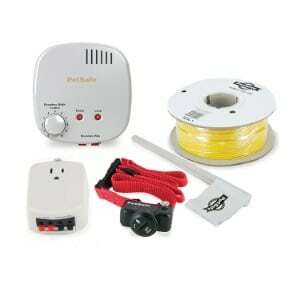 You also want to understand a little about wireless electric fences as well. Wireless electric fences are kind of the best of both worlds between the two wired fences that we were just discussing. With the wireless fence, the way that it works is by transmitting a signal that provides a circular containment field. If your dog goes outside of the circular area, then the dog collar receiver will activate and administer whatever corrections you have it set up to do. Your dog will eventually learn to stay inside of that field. Of course, there is a glaring disadvantage to this method. Since the transmitter sends out the boundary in the circular formation, it does not actually conform to the size and shape of your yard. You can adjust the signal strength, but you cannot adjust the shape of the field. That means that either parts of your yard will be unavailable to your dog or they will still be able to wander onto neighboring properties. There are a number of electric fence features that you want to be aware of because these are the things that you are going to be looking at when it comes to choosing the right electric fence system. Whether you are choosing the best underground dog fence or the best electric fence above ground, you are still going to have to be concerned with all of these features. If you are installing a wireless fence, then most of them are still applicable as well. Let’s take a look at these features one at a time and help you decide which are the most important and what you should be looking for as you examine each of them on the electric fence systems that you are considering. Collar: The collar is going to be a staple of your system whether you are talking about an underground fence, and above ground fence or a wireless electric fence. All of these fences still have collars. The collar is how your dog is able to receive the alert that your dog has wandered beyond the boundaries of the fence. There are typically three types of correction that are offered with these collars. The first is a tonal correction. This means that the collar emits a sound telling your dog that they are beyond the barrier. The collar may also vibrate for the same purpose. Often, these two types are used for training. Then, there are the levels of correction, which are low-level electric shocks. You should also consider whether or not multiple collars can be used with your system in case you have more than one dog. Levels of Correction: There are different levels of correction for each of the fences that you look at. The levels of correction that you have access to will typically determine how much control you have over your dog’s behavior. You want as much control as possible over your levels of correction, because they will determine how much of an electric shock you will be able to deliver to your dog – and the corollary – how little of an electrical shock you are able to provide. When it comes to correcting your dog’s behavior, you want to administer the absolute minimum necessary in order to prevent them from crossing the barrier; in fact, if you can get them to avoid the barrier based solely on training modes like sound or vibration; that is even better. Wiring or Field: Wiring is another feature of electric dog fences that you should be looking at. 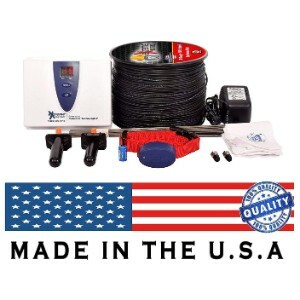 Whether you’re going with underground or aboveground wiring, you need to make sure that you have enough so that it is going to cover your entire yard or whatever space you have planned for your dog to play this is important, because if there is not enough room to cover your yard, then you’re going to have to buy additional expansion pack separately, and this can get expensive. That’s why it is a good idea to check the acreage or number of feet covered when you look at wired systems. For wireless systems, make sure that you have enough adjustability so you can fit it to your particular yard or space and that you can expand it later on if you need to do to moving. Charger: The charger is another thing that you want to look at when it comes to electric dog fences. The charger is usually pretty simple. It is often just an AC adapter that you plug the dog collar into, but there are a couple of things to keep in mind. For one, make sure that the cord is long enough for you to be able to reach your plug-ins, and two, make sure that it provides a fast charge. You should not have to charge your collar that often, but you want your charger to work fast when you do. Battery: Your battery is something else to look at. The battery life of dog receiver collars is an important consideration, because the less often that you have to charge your collar, the easier it is going to be on you. If you have multiple dogs and their collars are going out at various times, this is quickly going to become a huge pain unless you only have to charge your collar every few months or so. There are dog collars out there that you only have to charge every six months or even once a year, so you want to look for them when you are shopping for electric fence systems. Voltage Meter: Something else that may or may not be included with your electric fence system is a voltage meter. A voltage meter will allow you to do testing and make it a lot easier for you to install your electric fence. However, you may have to buy your voltage meter separately, because they are not included with all of the fence systems that are on the market. You also want to understand how dog fences are installed if you want to be able to choose the right one. Knowing all the steps that are involved in the installation of an electric dog fence will give you a much better idea of what to look for when you’re buying one. Obviously, installation is only one part of getting the right electric fence, but since installing your fence wrong is going to prevent it from working properly, not to mention probably taking hours more than necessary, you do want to know how to install it before you buy it. Installation varies a little bit from one fence to another, but these step-by-step instructions will be able to help you figure it out. Plot Boundaries: The first thing that you want to do is plot your boundaries. Before you even choose defense that you want, you should know exactly where you are going to install it. Plotting out your boundaries will allow you to get the right length and make sure that the fence that you choose is going to fit your needs. Make sure that you plot your boundaries on a continuous loop from the transmitter all the way back to the transmitter. Also, avoid electrical wires, TV cable wires, telephone wires and others whenever you can. Install the Transmitter: Next, you will install the transmitter. This is the first thing that you want to do with the wireless electric fence. In fact, this is pretty much the only thing that you have to do to install with a wireless electric fence. You want to install your transmitter somewhere dry that has protection from the elements. The garage is a good idea, but you want to make sure not to install it too near your circuit breaker. The manufacturer’s specifications should give you some instructions on where to place it. Lay Your Wire: Now, you’ll lay out your wire. You typically want to take this first step so that you can see exactly where the boundaries of your friends are going to be. This will allow you to make adjustments before you start connecting things, and it will save you time later on. You should already have done most of this work when you plotted your boundaries. Connect Your Wire: Your next step is to connect the wire together. This is done after you have finished laying everything out and you are happy with the boundaries that you’ve chosen. Connect the terminals of your boundary wires to the transmitter and make sure that everything is connected. Be aware that you have to make soft corners instead of sharp turns with these types of fences because angles can confuse the electronic transmitter. Install Collars & Test Your System: Now, test your system by taking a dog collar that has been turned on and using either the vibration or sound test mode. Make sure that you walk over all of the different parts of your fence and ensure that it is working properly. You can test the shock want to if you want, and many experts recommend this as it will give you an indication of what your dog is going to feel when he or she crosses the boundary. You will probably also have some customization in determining how close your dog has to approach the boundary of the electric fence before being notified by the receiving collar that they are out of bounds. Finalize Your Installation: Finalize your system by putting the wire and its permanent position. If you are doing an aboveground fence, then simply make sure that your anchors are in place and that you have secured the fence to make sure that nobody trips over it or doesn’t look too obvious. If you have a below ground fence, then this is the point where you’re going to start covering your trench areas with dirt and burying the wire anywhere between an inch to three inches underground. Make sure that you do not run your boundary wire too close your chain-link fence and add more wires if necessary if that is the case. Also, make sure that the wire is the right size as recommended by the manufacturer. Finally, make sure that your connectors are the ones that came with your fence system. Ground Your System & Conduct Training: Finally, you need to ground your system. Some fence systems are prone to power surges or may interact badly with a strike of lightning nearby. You should read your specifications to find out how vulnerable your system is to this, but even if it claims to not suffer that particular problem, it is better safe than sorry. Set up several grounding points according to the information in the owner’s manual and you will have a lot more peace of mind. The bottom line is that there are plenty of things to be aware of when it comes to buying an electronic dog fence. You have to worry about the type of fence that you want to install, how it specifically works and how to put together all the parts that come with it as well as the actual installation itself. You also have to worry about proper placement, grounding, battery life, configuration of the receiver collar and more. However, this buying guide should give you the information that you need to choose your own electric fence system for your dog. If you want to make things a little easier, then you can always go with one of the five products that we reviewed at the very beginning of the guide. Any of those are a solid choice when it comes to your next invisible dog fence.